NORMAL life in the Philippines is often disrupted by nature -- typhoons andoccasionallyvolcanic eruptions. The archipelago of more than 70islands is struck by typhoons several times each yearmainly between June and December. These storms can cause extensive damage and in some yearsup to 25 typhoons hit the country. Volcanoes are another marked feature of the islandslocated on the western rim of the Pacific tectonic plateknown as the Ring of Fire because of the numerous active volcanoes along the plate's edge. There are about 50 volcanoes in the Philippinesof which about 10 are active. When a volcano blows upit ruffles the lives of nearby inhabitants and far-away contractors and politicians. Eighteen months agoMt Pinatubo in Luzon province broke a 400-year slumber and erupted in one of the worst volcanic explosions this century. Thenin FebruaryMt Mayon in Albay province exploded without warningreviving the terror of Pinatubo. Although the Mayon explosion was minor compared to Pinatubofor the people living around these mountainssuch disasters are reminders that they could one day have to leave their homes and start life all over again elsewhere. The Aetasan aboriginal tribe that lived around Pinatubowere evacuated and resettled after the June 1991 eruptions. But the mismanaged rehabilitation of the Aetas is an example of how the tragedy of a natural disaster can be compounded. Still dangerous While the dust from the Pinatubo eruptions may have settleddanger still lurks on its slopes. Vulcanologists say there is also constant activity in the shallow depths of its crater and the danger of more eruptions is very real. Even if they don't occur for some timethere is a fear of occasional phreatic (underground) explosions and earthquakes. But the most immediate problem results from the volcanic material that has accumulated on the slopes of Mt. Pinatubo and adjacent mountains through intermittent eruptions. Visitors to Zambales provincewhere Pinatubo is locatedare greeted by an idyllic scene of white-clad mountains that frame vast stretches of what appears to be water. But the white on the mountains is not snow -- it's volcanic dust and the "water" is formed by largestagnant patches of lahar -- a slurry of water and volcanic sediment (see box). In timemore of this material will be brought down to the lowlands by rainwater and rivers. In factthe first lahar flow occurred on July 161991exactly a month after the biggest of Pinatubo's eruptions. It was terrifying and one eyewitness described it so: "On rainy daysthe flowing mass moves like fresh concrete and with such velocity and forceit destroys everything in its way." The lahar deposits have formed 30-metre-high canyons that dissolve and turn into a swamp when it rains. The threat of this happening is greatest from the passing typhoons. A typhoon can dump 250 mm of rain in 24 hours and this can expand lahars by two or three times. The rivers in the Pinatubo area -- O'DonellSacobia-BambanPasig-PotreroSanto Tomas and Bucao -- carry much sediment and some of their tributaries are clogged with debris. Heavy rainfall also increases the threat of flooding as the rivers that normally function as a natural drainage systemare choked. The regional disaster coordinating council at Camp Olivas estimates between August 1991 and October 1992about 1.2 billion pesos (US$ 50 million) worth of crops and farm infrastructure in central Luzon were destroyed by floods and lahar. 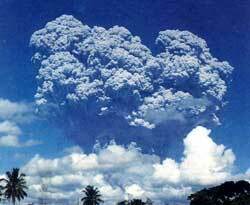 In June 1991Pinatubo exploded in a series of eruptionskilling 847 peopleinjuring 184 and leaving 23 missing. The dead included 281 from the eruption29engulfed by lahars and 537 killed by diseases contracted at evacuation centres. The eruptions also destroyed about 400housespartially damaged 700houses and affected 1.2 m people (one-fifth of central Luzon's population)including 560Aetas. Volcanic ash destroyed property worth 10.93 billion pesos (US $ 455 million)including 22500ha of agricultural land and fisheries. The disaster also put out of commission an estimated 600 industrial units. All this had an unprecedented effect on the already burdened economy of the Philippines. According to Leonor Briones of the organisationFreedom from Debt CoalitionA country, where 44 per cent of the national budget goes towards servicing debts, was forced to take an additional US$ 400 million to rehabilitate volcano victims. Philippine president Fidel Ramos recently estimated about 5000people still need to be relocated. Andthe realisation is only dawning that the Philippines is witnessing the opening act of a tragedy with the rest of the play yet to unfold. As Raymundo S Punongbayandirector of the Philippine Institute of Volcanology and Seismology (Phivolcs)put itWe have not seen the worst yet. The spectre of an impending apocalypseevoked by the transformed landscapehas also altered the landscape of the Philippine mind. New buildings with gleaming roofs have sprung up in volcano-damaged towns like San MarcelinoSan Antonio and San Narciscobut they also have a number of fatalistic neon signs: "Ashfall Disco" and "Volcano Restaurant". Lourdes Ladrigo-Ignacio of the Psychiatrists Foundation attached to the University of Philippinesexplains the physical havoc wrought by Pinatubo has been well-documentedbut the less obvious psycho-social costs have not been adequately assessed. A study in which 326 Pinatubo victims in Tarlac province rated themselvesshowed: 74.5 per cent feel tired most of the time; 73 per cent feel nervoustense or worried; 73.3 per cent often experience headaches; 54.9 per cent have "uncomfortable feelings in the stomach"and 49.7 per cent sleep badly. One of the victims said the images of that terrible day in June 1991 will remain in vivid memory always. A restaurant owner in a small town in Zambales provincewhose coating of volcanic ash gives it the look of an ersatz beach resorttalks animatedly of the time when twilight darkened the morning sky as stones and ash came raining down. "We closed our shutters and ran madly for our lives without knowing where to goshe recalls. The trauma in her voice is echoed by Luitgarda Manalaysay, an Aeta tribal, whose community was relocated in the Banquilan area about three km away. Says Manalaysay,We thought it was the end of the world and that the sun had fallen down." In many waysit's the Aetas who have suffered the most in the Pinatubo catastrophe. These aborigines have always regarded the mountain as their hometheir livelihood and their deityApo Namallari. But after Apo Namallari ragedtheir lives have been transformed. Herded into resettlement colonies on denuded hillsidesthey are now forced to break stones for a food dole -- on good days sardines and rice; on most daysriceand on bad daysno rice. The Banquilan resettlement area consists of bamboo huts on small plots where some bananacassava and runner beans grow. It overlooks what used to be the Bacao riverwhich is choked with sediment now as far as the eye can see. The Bacao has widened to several times its original size and inundated fields and orchards. It will widen further as the lahar eats into its banks and spells the doom of the paddy fields and mango groves that escaped the mud flow and are still magically green. It is on the banks of the Bacao now that the relocated Aetas harvest pumice-like stones formed by the lahar. The stones are broken up and the pieces taken in sacks by truck to denim stonewasheries. Each sack takes the better part of a day to fill and fetches the Aetas 13.50 pesos (55 cents)not enough to buy even a bowl of rice. The work is back-breaking but the Aetas have no alternative source of livelihood. The government denotified some of the forest land in the region and handed it over to the affected families. But the land is barren and located on distantscattered hillsides. Sowhile government records show the resettlement scheme in favourable lightthe reality is that it cannot ensure even a minimal standard of living for the displaced communities. When we came away from our land,says Manalaysaya mother of twowe had just the clothes we wore, some pots and pans. Before we came to Banquilan, we were huddled in a school room. We were 13 families, with our cattle and pets in that room. Those days were very hard. Manalaysay's little bamboo hut is on a hillside facing Pinatubo. Almost every night the area around the volcanoabout 25 km across the Bacaois constantly lit up by what appears to be lightning. After the eruptionsthe night air seems thicker and smells strongly of sulphur. In the morningthere is usually a fine layer of white volcanic dust all aroundespecially in the higher reaches of the hills. Manalaysay has learnt a craft -- she makes paper from the cogan grass or manila hemp supplied by the training centre set up by the Fibre Industry Development Authority. She also makes cardboard handbags to earn a little extra incomewhile her husband makes long-handled brooms that are a glut in Manila's markets and sell for 15 pesos apiece. The Manalaysay family exists on two meals a daybut there are many among the 883 families in the settlement who are not so lucky. Josephine Villanuevaa social work department volunteersays lack of food is a major problem. Child malnutrition and gastric ulcers among adults are listed as major health problems by Conrado de Castroa government physician who has worked for more than six months at the resettlement colony. "Because there are little or no prospects of livelihoodhe says,people are forced to eat less. Many subsist on meals of sweet potato and sometimesnot even that." Diarrhoea and respiratory illnesses are other serious health problems. "Have you seen the homes of these people?" asks Bong Yapa male nurse who works in the area. "The kitchen is in the middle and smoke fills the entire hut. Is it any surprise that babies die of respiratory illnesses?" That more people have died in the government-run evacuation centres than from the eruptions and the lahar flows comments eloquently on the sorry state of affairs. Social activists say of the 483 people who died in the campsas many as 447 were Aetas though they formed only 19 per cent of the Pinatubo evacuees. Some of their findings: Of the dead80per cent were children in the 1-4 age group; broncho-pneumonia caused 49 per cent of the deathsand epidemicsparticularly of measles and an occasional outbreak of malariaaccounted for 22 per cent of the deaths. Marlon Bantoon Roldana Manila-based Protestant pastor working in the areasays all this indicates the authorities' total lack of planning. "As long as the government shows on paper there are a certain number of resettlement campseveryone seems happyobserves Roldan.It disturbs me to see the mistaken priorities in the rehabilitation policy. For instancewhen people have no fooda helicopter pad for visiting leaders is given importance. I can never forget what an old tribal told me once'Sonit's not where we put our waste that's important; it's what we put into our mouths.'" Talking to the Aetas reveals their anger over misplaced priorities -- and their overwhelming feeling of helplessness. Isobello Manalaysayan Aeta chieftain of 73 families in the resettlement colonyexpresses it vividly: "We feel like tied-up chickens here. When we were on our landwe knew what we would do next. Herewe know only uncertainty." Of one thing he and his people are certain: They will try and pick up the broken thread of their lives in the resettlement campsbut they will never give up their original homes. Almost everyday somebody from the camp makes his way to the Pinatubo area and returns to report the mountain still rumbles like "a helicopter". If the volcano does not erupt again, we will go back,says chief Manalaysayhinting of his suspicion that "lowlanders" might grab the Aetas' ancestral land. He is quite aware that the "lowlanders" got a much better rehabilitation deal than the Aetas. The volcano-hit among them got better relief, we got the remainder. What they get to eat is never available to us. That's why I maintain constantly that what is meant for us must come directly to us and not through a third party,says the chief. "Iffor instancethey come up with a project proposing 10 days food for uswhat is sanctioned is for 7 days and what we finally get is for 2 days. As the leaderI have had many times to sacrifice my own family's needs so that the little we get is spread as widely as possible." What the Aetas rue most is their lack of access to arable land. Each family has been allotted half a hectare but the plots are on stonydenuded hillsides where only grass grows. The Aetas have planted a few mango saplingsbut it will be long before the land given to them can be made cultivable. Chief Manalaysay knows the strength of his community is linked to its roots in the mountains. "But the officials don't care about thishe complains. Social activists sensitive to tribal issues are consistent in their criticism that the rehabilitation plan for the Pinatubo victims is myopic and aimed atshifting the focus from agriculture to export-oriented industrialisation". 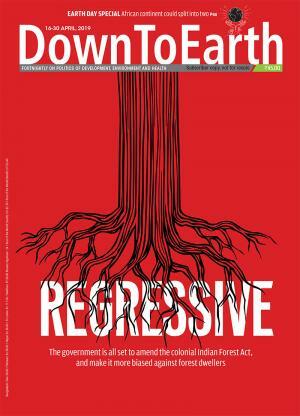 No attempt has been made to evolve a holisticforest-basedrehabilitation plan for the Aetasapart from ill-conceived attempts to get them to plant saplings on denuded mountain sides. The result is that Aetas have become a pool of cheap labour for manufacturing handicraftsbaskets and soap. And critics of the resettlement plan say it resembles earlier attempts by the government to exploit the Aetas and their land for commercial and military purposes. By all accountscorruption in relief supplies and rehabilitation efforts in the wake of the Pinatubo eruption has assumed major proportions. Says chieftain Manalaysay angrilyThe houses they built for us are worse than the toilets they built for themselves. On paper, they say each of these houses are worth 5,000 pesos (US$ 208), but it's impossible. If you account for all the material used, you'll know someone has made a killing. The Pinatubo eruption has fattened the wallets of a large number of contractors and their political contacts and the extent of their role in the corruption in reconstruction and relief supplies is surfacing slowly. In Octoberthe department of public works and highways identified five companies -- one of them owned by a Filipino congressmanas being suspected of cheating on lahar-clearing projects. Andpublic works secretary Jose de Jesus now concedes crooked contractors may have defrauded the government by as much as 500 million pesos (US$ 20.9 million) in fictitious lahar-clearing. The Pinatubo eruptionthenis a multifaceted tragedy. At one levelit is a natural disaster of a magnitude that has affected the global climate and left large tracts of land completely barren. At another levelthe Pinatubo tragedy has been compounded by a display of avarice of truly epic proportionswith even senior politicians fattening eagerly on the misery of others. But what is most tragic is that a tribal community has been uprooted and left to the mercy of mindless bureaucrats and small-time entrepreneurs.